I once went up the leaning tower of Pizza, and I was surprised at how much space there is on the spiraling arcade, both in width and height. It’s much bigger in Real Life than it is in the photographs. Giotto drew* some very nice buildings like it, often they were pink; it’s a pity that none of them was built. 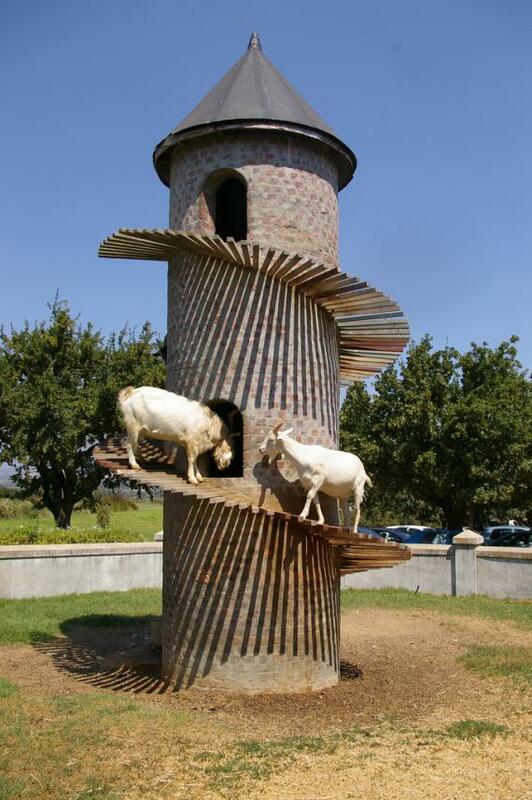 This South African vineyard with the high-rise goats: it wouldn’t be near the wonderful Goats do Roam vineyard, would it? Initially inspired by the roaming Saanen goats on the Fairview farm, the Goats do Roam winemakers draw inspiration from various regions while still aiming to express a truly South African wine style. Apparently there’s also one called Goat Door.